Lighthouse Beach Holiday Village is at Lighthouse Beach on the southern fringe of Port Macquarie. If approaching from the south, turn off the Pacific Highway at Kew and take the scenic route through Laurieton, North Haven, Bonny Hills and Lake Cathie. When you arrive at the outskirts of Port Macquarie, you will see the golf course. Turn right at the next road, Matthew Flinders Drive, and follow it for about 1km. Lighthouse Beach Holiday Village is on your right. If approaching from Wauchope and the west, follow the Oxley Highway into Port Macquarie until you get to a roundabout where the road becomes Gordon Street. Continue along Gordon Street to its end, passing Horton Street and the CBD. At the end of Gordon Street turn right then left around the high school. At the end of this street, you will turn right onto Pacific Drive which you will follow along the coast until you turn onto Lighthouse Rd then right onto Matthew Flinders Drive. This road takes you down to Lighthouse Beach. Continue along the beach and you'll find Lighthouse Beach Holiday Village on your left. If approaching from the north, turn left towards Port Macquarie on Hastings River Drive. This road will take you through two roundabouts and at the third turn left onto Gordon Street and continue along Gordon Street to its end, passing Horton Street and the CBD. At the end of Gordon Street turn right then left around the high school. At the end of this street, you will turn right onto Pacific Drive which you will follow along the coast until you turn onto Lighthouse Rd then right onto Matthew Flinders Drive. This road takes you down to Lighthouse Beach. 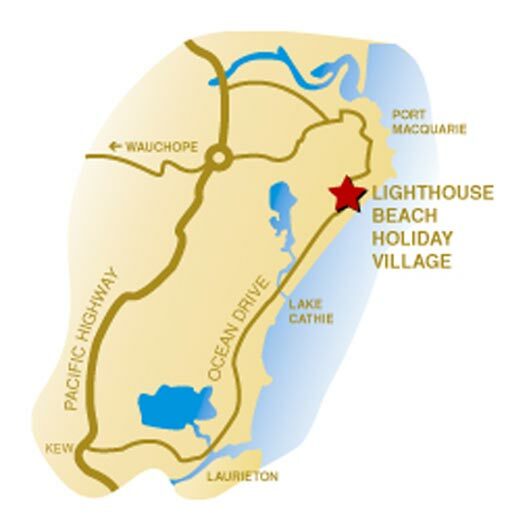 Continue along the beach and you'll find Lighthouse Beach Holiday Village on your left.